Ahmad Galaleldeen, Ph.D., was a doctoral student when his faculty mentor showed him a graphic of what appeared to be colorful abstract patterns. In fact, it was a brand new molecular diagram of an important enzyme, and Galaleldeen was among the first to see it. 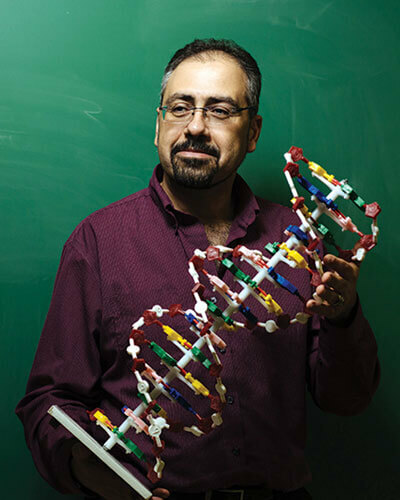 To structural biologists like Galaleldeen, molecular diagrams are blueprints for molecular structures including proteins, which are an integral part of all living things. These diagrams can be treasure troves of medical information, giving clues for new drug therapies and vaccinations. Galaleldeen’s current research focuses on outlining mutations in the gene superoxide dismutase 1 (SOD1), an essential enzyme for normal cell activity. Abnormalities in SOD1 have been linked to Lou Gehrig’s disease, or ALS (amyotrophic lateral sclerosis, which attacks the cells that control muscles), and Galaleldeen hopes that comparing normal and abnormal gene structures might give insight into the origins of ALS or even an effective treatment. “People have been working on ALS for 160 years now, since it was discovered, but we do not have a single drug that can make a person live one month longer,” Galaleldeen said. Though ALS remains a mystery, work like Galaleldeen’s to understand its molecular makeup is a significant piece of the puzzle. In June 2013, Galaleldeen was named a Biaggini Research Program fellow at St. Mary’s, allowing him to continue his research. Outlining molecular structures is a tedious process, but one Galaleldeen pursues with verve.